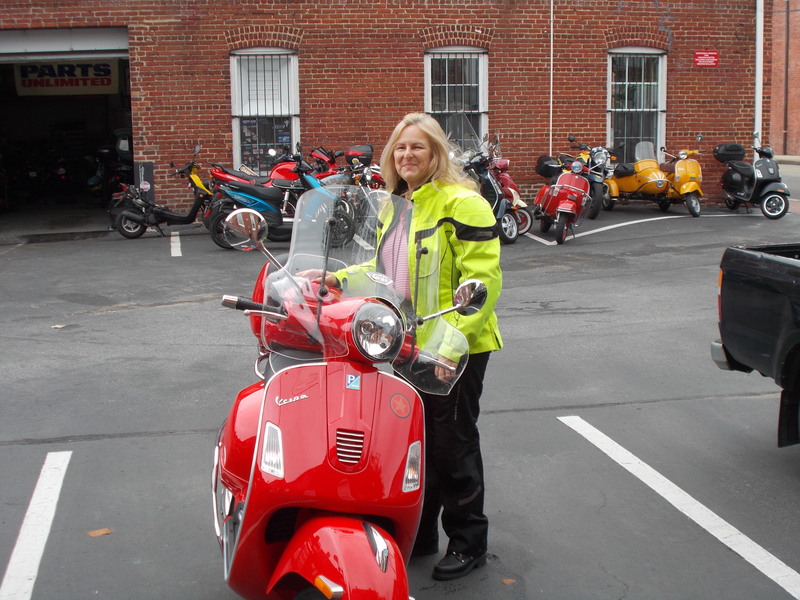 It was supposed to be a simple day: Get up early, take the Yamaha to Richmond to reacquire Linda’s Vespa, and come home. 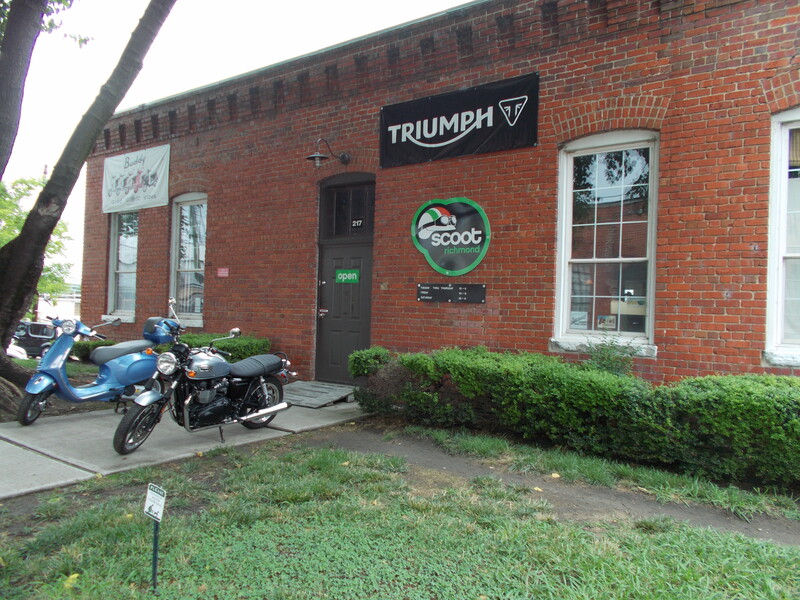 Linda’s bike was at a shop called Scoot Richmond, a full-service dealer in Vespa scooters and Triumph motorcycles. We’d dropped off her scooter six weeks ago for body work, a tune-up, and new tires. 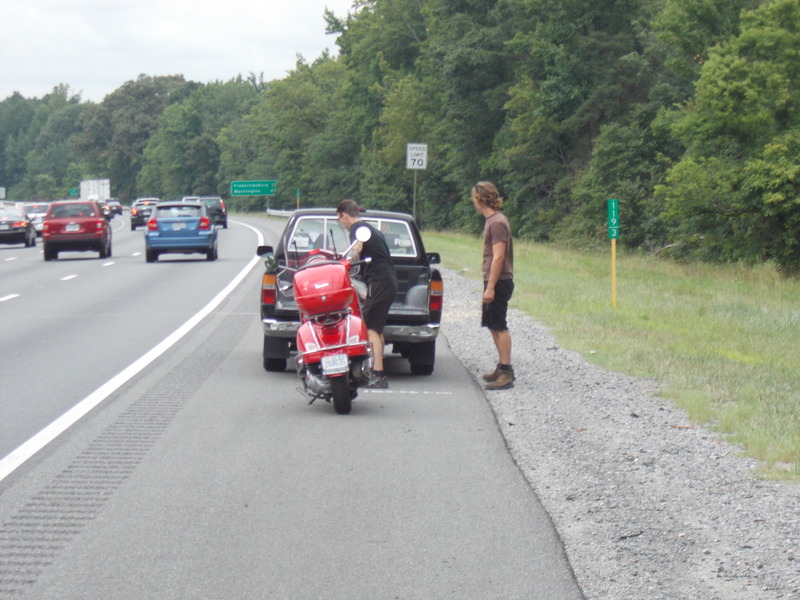 Getting the scooter there and back is an exhausting process – Richmond is about 110 miles from us down I-95, which is a miserably crowded highway in the summer. But the shop is the closest one for mechanical and body work on Vespas. We’ve been there before and they seem pretty good. 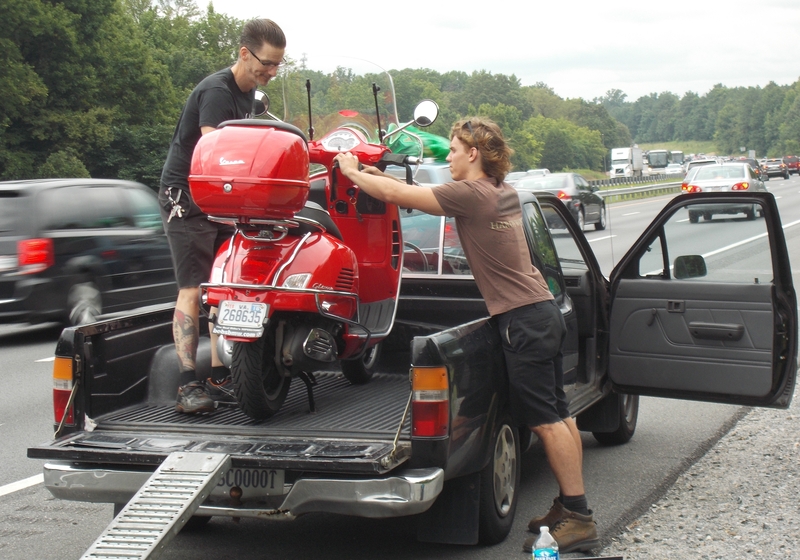 I should have expected trouble, because we had difficulty getting the Vespa there in June. Linda was riding it and I was following on Terra Nova, my Yamaha Super Tenere. After getting off the highway (two miles from the shop!) the Vespa stalled out at a city intersection and refused to start. I’m pretty much mechanically illiterate, but I know some basic stuff. We parked in the delivery bay of an office building, mercifully closed, and I tested for vapor lock, switch settings and whatnot. The bike cranked over fine, but didn’t want to fire. It appeared low on fuel so I rabbited off to the nearest gas station – in an apparently dicey part of town, judging from the thickness of the Plexiglas inside the building – and returned with a two-gallon container of Sunoco high-test. That didn’t help. We called Scoot Richmond, which sent a Toyota pickup. After filling out some paperwork, we went home. Over the next few weeks, I phoned SR for updates, with particular interest in what caused the stall. They were working on it. “What caused it to stall?” I ask. I suppose this sounds logical. I don’t have much experience with Vespas, they’re exotic machines, but this simple explanation could be possible. Linda isn’t convinced. “It doesn’t sound like you addressed the problem,”she says to one of the mechanics. But the Vespa starts up fine and idles perfectly. So we ride away, north on I-95. She’s lead, I’m wingman. I-95 is the highway we love to hate. It’s the main freeway down the East coast and it’s a perpetually gridlocked parking lot in summer, especially on weekends. We left home extra early to avoid the crowds heading for Virginia Beach and we hope to miss their mass migration home. There are other roads to Richmond, of course, but they’re out of the way. Distance can negate speed. We’re moving pretty well, but traffic starts blocking up and soon we’re in pause-and-crawl mode, in the right-hand lane. Everything stops a little north of the Thornburg exit, and Linda turns around on the Vespa and says something I can’t hear. Something’s amiss. “I can’t get it started,” she says. It’s the same thing we encountered six weeks ago: the starter cranks heroically, but the engine won’t fire. Uh-oh. I turn Terra Nova to the right and we move into the breakdown lane. We set the bikes on their centerstands and pull off our helmets. I start checking the Vespa. Traffic starts moving again, leaving us behind. It’s around 3 in the afternoon and we’ve come 50 miles. I call Scoot Richmond and they say they’ll send out a truck. I try different things, including adding more fuel just for the hell of it, without success. And we wait. I call my father in Cleveland to see if he has any ideas. He makes some suggestions and wishes us luck. Traffic speeds up and the bikes rock a bit in the backwash of passing trucks, even Terra Nova, which weighs around 560 pounds. Passers-by mostly ignore us, including the occasional motorcyclists, who are guilty of breaking The Code of the Road, which mandates a motorcyclist should always offer aid to a stranded biker. Perhaps we don’t look desperate enough. Only one couple, in a white pickup truck with a caged German shepherd in the back, stop to offer help. “We ride, too,” the woman says, and we thank them and explain someone is coming. I keep fiddling with the Vespa and after 70 minutes of waiting – I check my watch – I try the ignition and the engine starts. I figure it has to be a balky fuel pump that’s affected by heat. The engine starts smoothly and idles perfectly each time I try it. We wait for the SR truck anyway; the bike isn’t safe to ride. Two hours after our breakdown, the SR truck – the same black Toyota that rescued us six weeks ago – arrives around 4:30. Two guys load the Vespa and secure her with tie-downs. They apologize for taking so long and say they’ll check it out. We watch them drive away. We’re two-up on the Yamaha and we find a Friendly’s restaurant and stop for ice cream. Over black raspberry and watermelon sherbet, I think about the Vespa and how I’ve never been stranded on the road with mechanical failure. Mostly, that’s because I pay attention to preventive maintenance. But I really should be a better mechanic. We did have a minor breakdown aboard Discovery, my Yamaha Virago, near Indio, California; an E-clip slipped off the gearshift pivot and the shifter fell off. I was able to rig a clip with a grommet from a tool roll and some baling wire and soon we were on our way. That was years ago. But today’s not over yet. Traffic is light on the way back to I-95 and we pass a series of shopping centers. I see a brown car make a right turn from a parking lot on my right. To my astonishment and growing anger, the driver speeds up and races for the far-left lane, the one we’re in, totally unaware he’s about to sideswipe us. I hit the brakes, hard, and Linda’s helmet bangs into mine. The car moves into the lane ahead of us and the traffic light turns red. We’re safe but I’m furious and somehow in the rush of picoseconds I think about a motorcycling friend of ours, who was on a bike and hit by a teenager running a stop sign. His wife, on her own bike behind him, saw everything with horrified eyes. He ended up losing a leg. The driver turns out to be a girl, maybe in her late teens, brown hair, cute, clueless, deadly. She turns toward us in shock and says, “I’m sorry,” genuinely surprised, and I glare while simultaneously almost feeling bad for her. I hear Linda say – incredibly polite as ever – “Ma’am, you almost caused a wreck. You really need to watch,” and the girl sorta shrinks back into her seat. The light turns green and I throttle away with an overlap of emotions, fury at the near-collision, at her obliviousness, and shame at making someone else feel bad. A polite conversation would not have been possible, I suppose. Nor would it have had the same lasting effect. We make it home exhausted without further incident – an 11-hour day, all told – and use the Jeep to go to dinner, slaying a bottle of Tormaresca in the evening. This week I’ll research fuel pumps and pester Scoot Richmond. 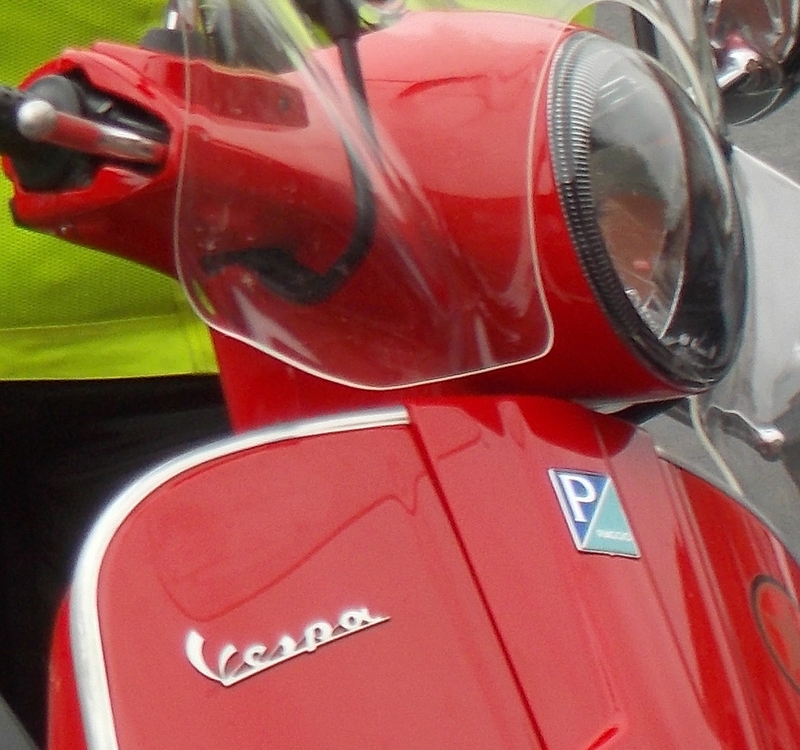 With luck, we’ll be able to reacquire the Vespa next Saturday, without the need for rescue. Oh my… glad to hear that you are home and safe again. 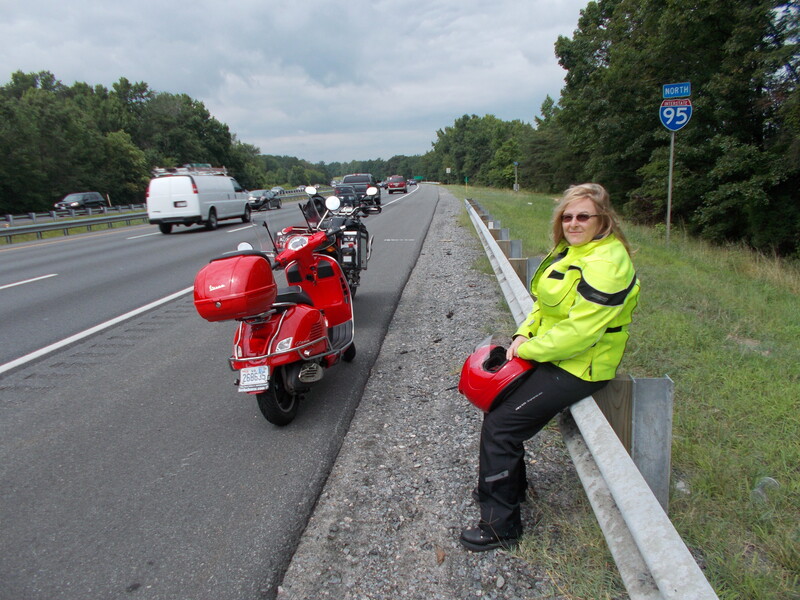 Your blog was a good reminder to me to watch out for motorocycles. As for the Vespa, how frustrating. We have a hard time finding mechanics we trust, but we have more options. The last one put our (2002) van up on the lift and bent the heck (and cracked) the sheet metal. by our sliding door. (They just weren’t careful about picking where they put the supports.) We won’t be going back, but now we have to find another place. Good luck on your reacquistion!